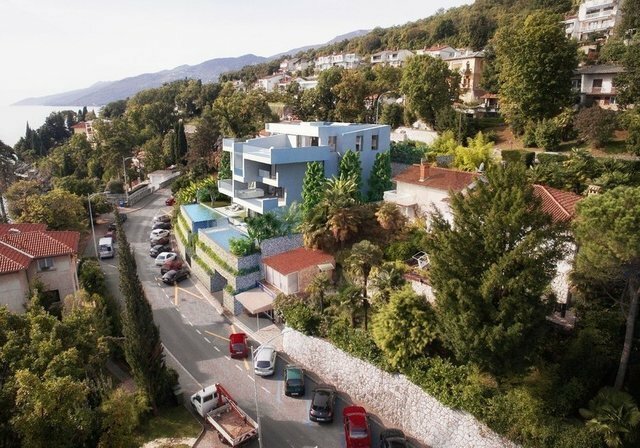 Marquize Diamond apartment at the Diamond Residence in Opatija is located on the second and third floor of a luxury residence close to the very center of Opatija, a historical touristic city in North Adriatic. The Marquize Diamond apartment has a total surface area of 350 square meters and the living area of the apartment is 237 square meters. The apartment is a two-level apartment and consists of an open plan living area with a kitchen, dining room, living room with a spacious terrace and a view of the sea with a whirlpool area. The apartment also has two bedrooms with ensuite bathrooms and guest toilet, as well as 2 parking spaces in the garage, one outside space for guests and a storage room with the engine room. High-quality materials and charge point for electric cars, an elevator that runs directly to each apartment, surface heating and cooling of Aquaterm and Toshiba, make this object a low-energy building class A. A remote control system for each apartment makes living even more comfortable. Marquize Diamond is an apartment with comfortable and spacious rooms with 64 square meters living room, this apartment is a luxurious apartment for staying and enjoying the charms of the Mediterranean and Kvarner Bay within 5 minutes reach of famous Opatija promenade along the sea. Diamond residence with luxurious apartments is close to Rijeka airport, Zagreb, and Pula airport and offers exquisite and incomparable apartments for private luxurious enjoyment.